And now, from the sublime to the... well, you know. 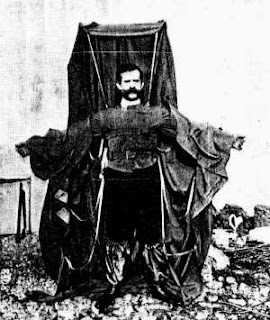 Franz Reichelt was an Austrian tailor who designed an overcoat that would act as a parachute, floating its wearer gently to the ground. To demonstrate his invention, he planned to send it off the first deck of the Eiffel Tower, using a dummy. Having obtained the correct permissions, however, and invited the gentlemen of the press, he decided at the last minute to test it in person, himself, possibly in response to the presence of newsreel cameras. He strapped himself in and, after modelling his invention on the ground for the cameras and assembled crowds, climbed to the the first deck. There he hesitated several moments, poised on the rail of the deck, looking down at the ground. Finally, with a little thrust forward, he launched himself. With a 60 metre drop, the results were predictable. They were also caught on film, which can be viewed on YouTube, of course. 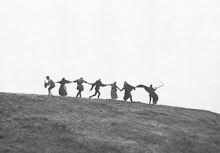 On the film, a title in French appears: "Comme s'il eut pressenti l'horrible sort qui l'attendait, le malheureux inventeur hesita longuement avant de se lancer dans le vide." It means "As though he sensed the horrible fate that awaited him, the unfortunate inventor hesitated long before throwing himself into the void." At the end you see them take his body away, and then the police measuring the depression in the ground made by his impact.